With India hosting the 2018 edition of Men's Hockey World Cup, fans of the game are rooting for the Indian contingent in their own unique ways. Young students are not far behind in showing support to the 'men in blue'. 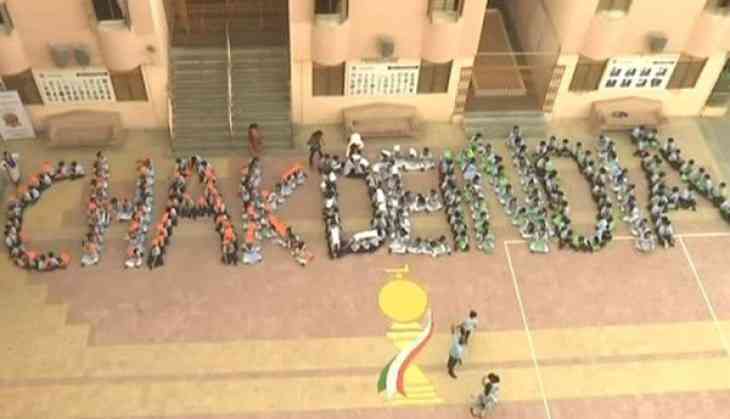 Students of HB Kapadia New High School in Ahmedabad made a formation that read 'Chak De India' to rally their support for the Indian hockey team, who are among the 16 teams participating in the event. Approximately 250 students of classes 5th to 8th, were part of the formation in tricolours of India's national flag, said the school's activity coordinator Bharat Vincent. Talking about the unique activity, Vincent said that the idea was to support the Indian hockey team in the tournament, as well as promoting the sport. "The school is dedicated to moulding its students into global citizens. In this regard, we have been integrating different events, international days and upcoming sporting events with its curriculum. For Men's Hockey World Cup, we made a plan to inculcate sports learning in the students of classes 5th to 8th. In drawing subjects, we told them to make flags of the 16 participating nations, as well as mascots and logos. All of these were displayed nicely along the school corridor," Vincent told ANI. He underlined that the objective of the initiative is to motivate the Indian contingent in the Men's Hockey World Cup and to take the learning of sports beyond classrooms. "When we have integrated the learning of sports with upcoming events, it is enhancing their current affairs on sports and we feel that the kind of motivation students have been given will inspire the Indian contingent and totality," Vincent added. A student of class 7th, Aastha Patel, told ANI, that the human formation was to support and motivate the Indian hockey team in the Men's Hockey World Cup. Yesterday, the prestigious tournament kickstarted with a star-studded opening ceremony at the Kalinga Stadium in Odisha's capital city Bhubaneswar. India will begin their campaign against South Africa today.